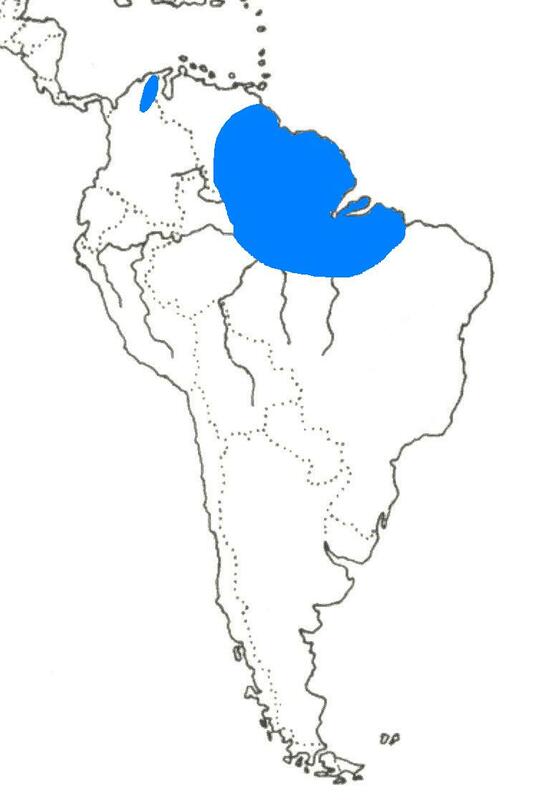 Dusky Parrots are found in southeast Venezuela, Guyana, Surinam, French Guiana and a large part of northern Brazil. Most peculiarly, a small population also inhabits northern Colombia. A certain German, Mr. Diefenbach, most probably obtained the first successful breed in 1986. From the 5 eggs laid by his breeding pair all 5 chicks were reared successfully; an excellent result! The Dusky Parrot is a definite forest dweller that is rarely seen in open plains. There aren’t any subspecies. 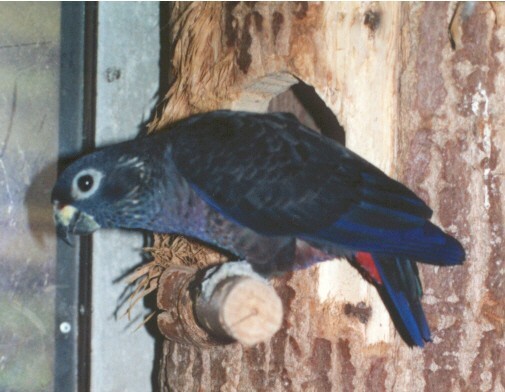 Unlike the other darker Pionus species, such as the Bronze-winged Pionus, Fuscus behave very aggressively in the aviary. Especially during the breeding season they tend to approach their attendant with a spread tail, arched back and raised neck-feathers. By making a lot of racket they probably try to defend their female. They definitely have the loudest voice among the Pionus species, but fortunately rarely use it. These birds have only been imported once before the nineties. I acquired my birds from the first shipment in the early nineties. Afterwards numerous smaller shipments occurred. I had never seen a Dusky Parrot before, and my inexperience with this species caused a lot of problems. Many birds of the first imported shipment died. Fortunately, I was able to acquire bred birds afterwards. I only obtained my first successful breed in 1998. The chicks strongly resemble their parents but their brown-coloured feathers are paler. Each adult bird has its own individual coloration; some are mainly brownish, some have a more purple abdomen, some have very light colours and some males have a beautiful silver shine on their back. Imported birds nearly always look a sorry sight (see picture below). 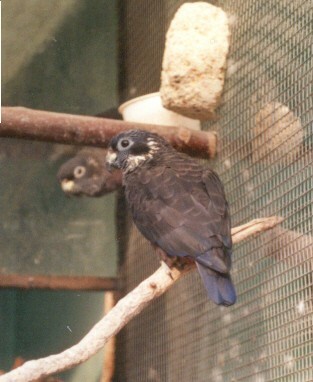 The coloration of their plumage has become dull, due to the many weeks’ or months’ journey in boxed cages without being sprinkled. Their wings are often cut after being caught. 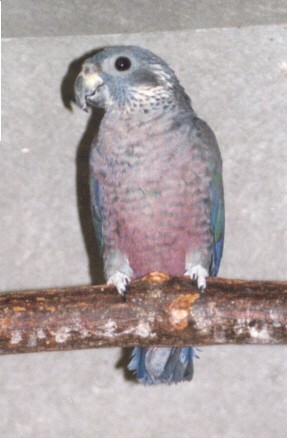 A Dusky Parrot that is well taken care of and has a good moulting period is a beautiful sight. Early April (if the weather allows it) they lay approximately 3 to 5 eggs. A two-year-old female and a three-year-old male (or older) will make prolific breeders. When the first or second egg is laid they usually start brooding with an incubation period of about 26 to 30 days. We should treasure our own-bred Dusky Parrots. They are extremely popular, since breeders have only been recently successful at breeding them in captivity. The first successful breed in Belgium was probably accomplished in 1996 by a friend of mine, Mr. Sermeus from Malines.